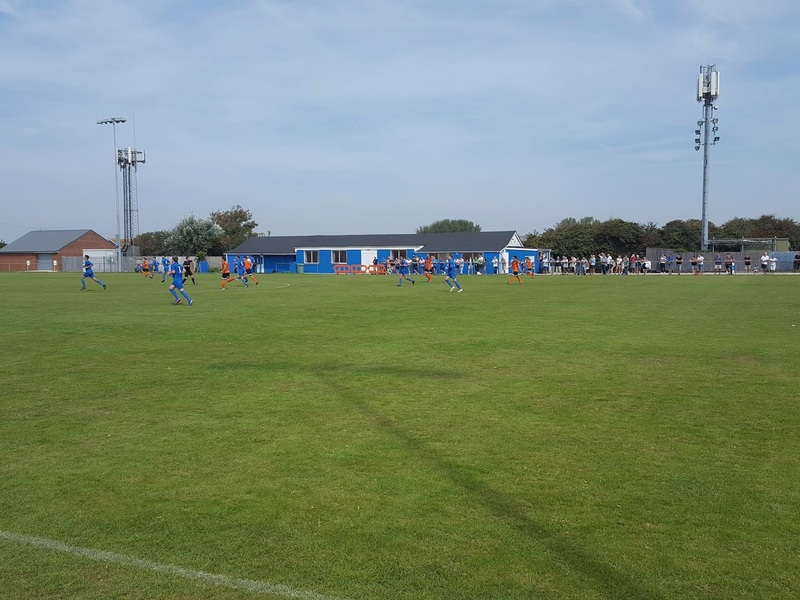 My twentieth ground of 2017 was on Monday 28th August at the High Street Ground in Selsey, West Sussex. 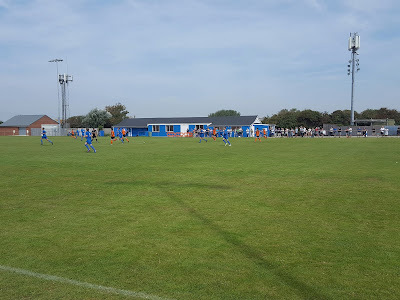 The match was Selsey vs. Midhurst & Easebourne in Southern Combination League Division One. As its name suggests the High Street Ground is in the centre of the town of Selsey. The ground is bordered by housing estates to the south and west and several businesses to the south. The football club are neighbours to a Co-Op supermarket and the town's cricket club which sits behind the northern side. The town is not served by a railway station with the nearest one at Chichester which is 7.5 miles north. The venue has been home to the club since the late 1940s. The turnstiles are located in the north-eastern corner of the ground and upon entering there is a flat concrete area which extends for a third of the northern side. The middle third of the northern side is home to the clubhouse which consists of dressing rooms, a spectators bar, a separate members room and a food outlet facing out towards the concrete section. There are then three picnic benches in front of the food outlet. The remaining northern third is off-limits to fans with an adjacent property backing onto it. The venue's only stand straddles the half-way line on the southern side. This was formally a covered concrete terrace but has had 118 seats added to the structure with the back row remaining as a standing viewing area. The two dugouts bookend this stand so are quite a distance from each other. The remainder of the ground is uncovered standing. There is a decent amount of space behind the western goal but with a car park directly behind the eastern end this is little more than a walkway with a thin section of grass behind the hard standing area. The first quarter of the game had very little in the way of action but as the game passed the 20 minute mark Selsey began to stamp their authority on the event. They came close in the 23rd minute when a ball over the top found Joe Clarke but when Midhurst keeper Bill Nash came out to meet him Clarke could only steer his shot the wrong side of the post. The final ten minutes of the half saw good chances come and go for Morgan Forry, James Kilhams and Forry again as Selsey were unable to make the breakthrough. In the end Selsey's opening goal was given to them on a plate. Less than a minute after the restart a risky backpass led to Nash slicing his clearance straight up in the air and as it came down it landed with a Selsey attacker who was felled by a defender going for the ball at the same time. 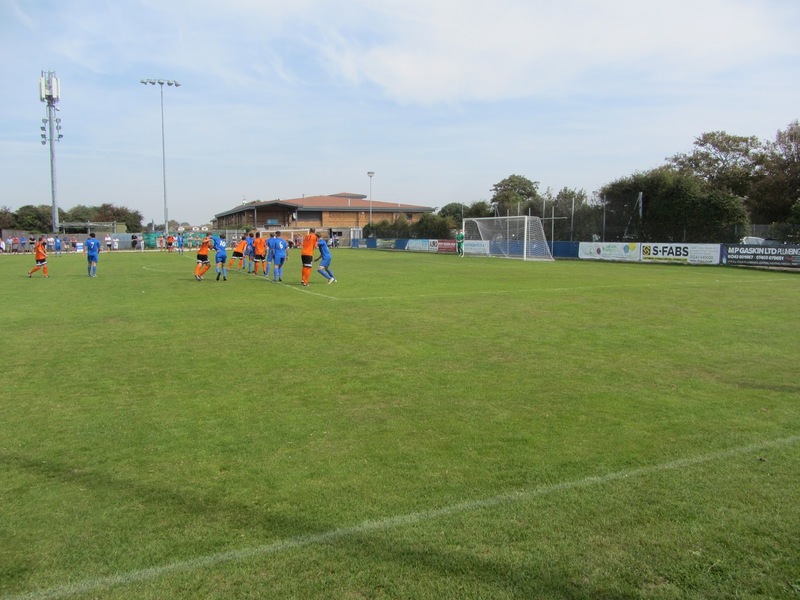 Morgan Forry struck the penalty low to the keeper's left and it went in off the post. A quarter of an hour later the referee pointed to the spot again after he spotted an infringement in the away penalty area after a corner was swung into the danger zone. This time it was Jake Goulding on penalty duty and he dispatched the penalty straight down the middle. In the 75th minute Selsey almost wrapped things up after dispossessing Midhurst in their own third of the field - the ball was played through to substitute Jake Edwards but with the goalie to beat he shot over the bar. In the 82nd minute the visitors were reduced to ten men when Lewis Hamilton received his second booking for persistent fouling. 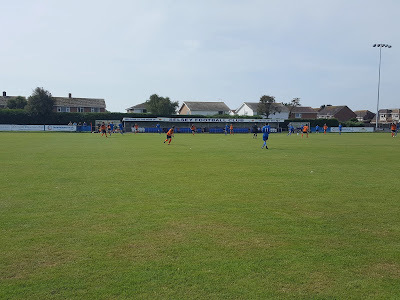 Selsey's anticipation of seeing the game out calmly took a knock in the 86th minute when Midhurst grabbed a goal back - the ball was sent across the area from the right and with it being missed by a defender it fell to Gary Norgate at the far post. Norgate smashed an excellent finish across goal into the top corner. This meant a nervy final few minutes but into stoppage time the hosts were able to get the ball in the corner and run down the clock to keep up their winning start to the season.